Johanne Chapungu Oposi, who is from Chimanimani which was affected by Cyclone Idai, says his former classmate and his family, and a neighbor were buried alive when a hill collapsed on them while they slept. Government spokesman Ndavaningi Nick Mangwana in Harare, March 18, 2019. 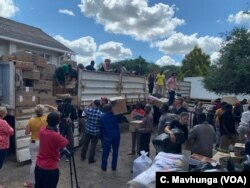 Volunteers bring donated goods to be transported to Chimanimani and other affected areas by Cyclone Idai, March 19, 2019.